A very happy birthday to Martha Dorris, who is GSA’s deputy associate administrator in charge of the Office of Citizen Services. Her office oversees, among other things, the federal government Web portal, USA.gov. 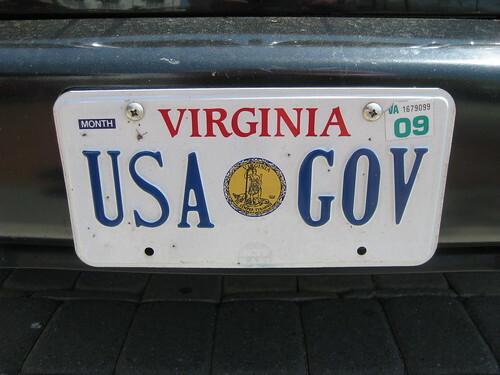 (If you have any doubt that she loves her work, check out the license plate on her car!) In her non-work hours, she heads the American Council for Technology (ACT). She also serves as the head of the corresponding International Council for Information Technology in Government Administration (ICA). * 1493 Christopher Columbus set sail from Cadiz, Spain, with a flotilla of 17 ships on his second voyage to the Western Hemisphere. * 1775 American Revolutionary War hero Ethan Allen was captured by the British as he led an attack on Montreal. * 1890 Mormon president Wilford Woodruff issued a manifesto formally renouncing the practice of polygamy. * 1981 Sandra Day O’Connor was sworn in as the first female justice on the U.S. Supreme Court. * 2001 Michael Jordan announced he was returning to basketball with the NBA’s Washington Wizards.